“This report does not belong only to the President. The responsibility of the President is to first make the report available to the masses so that they could get information. As presidential commissions are maintained with people’s money to investigate regarding people’s money people have a right to know the information in these reports. We demand the President not to keep the report for himself but to reveal it to the country. Secondly, the President should implement recommendations of the Commission,” says the Leader of the JVP Anura Dissanayaka. 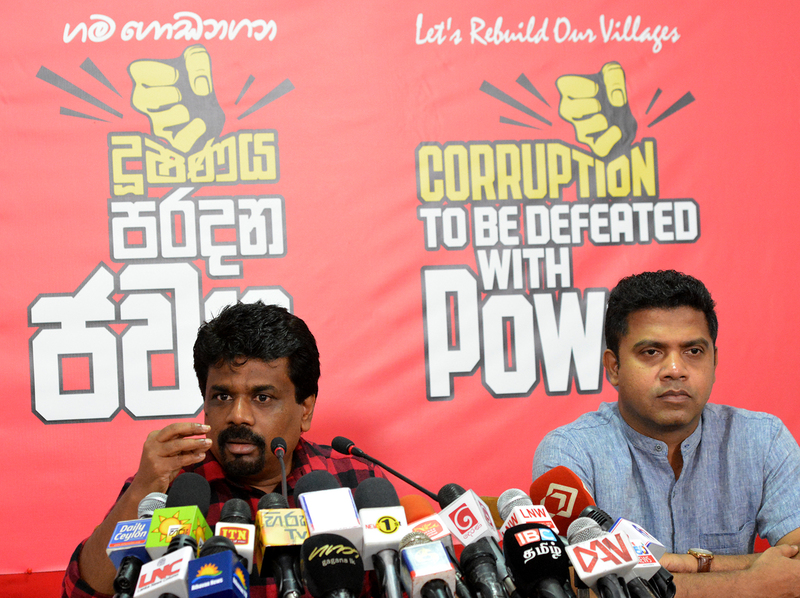 He was speaking at a press conference held at the head office of the JVP at Pelawatta today (1st). The Member of the Central Committee of the JVP and Kalutara District parliamentarian Dr. Nalinda Jayatissa too was present. Speaking further Mr. Dissanayaka said, “The biggest dialogue that surfaced in the country in electing President Maithripala Sirisena was on frauds, corruption and waste. There were two objectives in such a dialogue. The first is the arrest of those who were involved in frauds and corruption and punish them. The next is to stop committing frauds and corruption of future administrations. On 3rd January this government has been in office for three years. A three year period is more than enough to decide the good and the bad of a government. This government has a path that goes against the mandate it received on 8th January. The biggest fraud of this government is the Central Bank bond scam. This dealing takes place on 27th February 2015 after the government was formed on 8th January – less than 50 days of forming the government. After this fraud was committed we, of the JVP, revealed the fraud to the masses and demanded the government to punish the perpetrators. A report was presented despite obstructions in Parliament and in COPE. In spite of the fraudsters had been exposed in COPE and Audit reports, the government failed to bring the perpetrators before the law. The government paid scant attention to those reports. Subsequently, a Presidential commission was appointed. The details discussed in the Commission were reported by the media. Finally, on 30th December the report on the bond transaction was handed over to the President. This report does not belong only to the President. The responsibility of the President is to first make the report available to the masses so that they could get information. As presidential commissions are maintained with people’s money to investigate regarding people’s money people have a right to know the information in these reports. We demand the President not to keep the report for himself but to reveal it to the country. Secondly, the President should implement recommendations of the Commission. There would be several recommendations in the report. According to these recommendations, they should be referred to the Attorney General and take legal action against perpetrators. This report should not be allowed to be swept under the carpet. What has taken place in our country until now is that a fraud committed later obscures a fraud committed earlier, one commission report veils and earlier commission report and a fraudster is hidden by another fraudster. This is the drama acted in our country until now. Also, a special presidential commission was appointed at BMICH to investigate and inquire into serious acts of fraud, corruption and abuse of power, state resources and privileges. Its term ended on 3rd December. During the term of this Commission, several investigations were carried out on the plunder of state assets, abuse of power, misappropriation of state funds and the President was handed over 17 reports on their findings. Among them were the report on Rs.110 million financial misappropriation was handed over in May 2016; the investigation report on Avant Garde was handed over in October 2016; the investigation report on the loss of Rs. 200 million by importing outdated explosives was handed over in October 2016; the report on SriLankan air Lines in January 2017 and the report on Basil Rajapaksa deploying aircrafts for his journeys. However, the country is not aware of the action taken regarding these reports. We made a special request in parliament to make them available to Parliament. They have not been presented to Parliament either. We have a suspicion these reports would suffer the same fate as the earlier reports.Hence we demand the President put these reports before the country. We, according to the ‘Right to Information act’ hope to make a special request to the Presidential Secretariat. We would request them to give us copies of the reports of the Presidential Commission of Inquiry appointed to investigate and inquire into serious acts of fraud, corruption and abuse of power, state resources and privileges and the copy of the report of the Presidential Commission of Inquiry investigating into the Treasury Bond issue. For, there is a tradition in the country which sweeps under the carpet any commission report. Committing frauds, investigating them, sweeping reports under the carpet, using money plundered in politics have become episodes of a drama. The biggest parasite in our country is frauds and corruption. The biggest danger is the existence of fraudsters in the government and the government conducting investigations on its own frauds and corruption. Today, opposing corruption has become a fashion. The President, Ministers and MPs of the SLFP gave an oath not to indulge in frauds and corruption. The President should have made his oath at the presidential election. Now, he has to make a pledge to punish those who are involved in frauds and corruption. Also, S.B. Dissanayake, Nimal Siripala, Jagath Pushpakumara, Susil Premajayanth, Duminda Dissanayake, Anura Yapa and other ministers and MPs who took the oath should have first apologized for the people for the frauds and corruption committed until now. Also, they should promise that they would not commit any frauds or corruption hereafter. They attempt to make use of the people’s opposition to frauds and corruption to their advantage deceivingly. There are several investigations being carried out by the FCID. A financial fraud of Rs.1.5 million that had been committed in Dehiwela – Mt. Lavinia Municipal Council. Rs. 373 million fraud committed in Mahiyangana Pradeshiya Sabha, A dealing of Rs. 64 million in Katharagama Pradeshiya Sabha, against the Mayor of Moratuwa Municipal Council, the Chairman of Palinda Nuwara Pradeshiya Sabha, Rs.10.5 million illegal transaction in Kesbewa UC and frauds in Kelaniya PS, BandaragamaPS, Benthota PS, Colombo MC and Peliyagoda UC are some investigations being carried out by the FCID. Those who ruled these local government councils are now with President Maithripala Sirisena and former President Mahinda Rajapaksa. These suspects have become candidates of their parties. Large-scale fraudsters and the corrupt have become organizers of Mr. Maithripala Sirisena’s party. As such, our country has reached a stage where a genuine voice against frauds and corruption should be raised. There are many factors to show that the Prime Minister is involved in the Central Bank bond scam. Also, the Prime Minister and several ministers have been summoned to the commission and were questioned. As such, the report of this commission should not be allowed to be swept under the carpet. the present laws – his decision is final?